Orval | Beer Apprentice - Craft Beer News, Reviews, Interviews and Info. Hello everyone. I hope all is well. I must say I’m very excited about today’s craft beer review because I’m going to be trying one of the most highly praised brews ever produced. The Orval Trappist Ale brewed by the Brasserie d’Orval S.A. located in Viller-devant-Orval, Belgium. The website, http://www.orval.be/, is chocked full of information on the brewery, so I would recommend you check it out. Here is the commercial description on the Orval Trappist Ale. In contrast to all the others, the Orval Trappist brewery makes only one beer for the general public. It has an intensely aromatic and dry character. Between the first and second fermentation’s there is also an additional dry-hopping process. Through this the beer acquires its pronounced hoppy aroma and extra dry taste. Bottled at 5.2% abv – can go up as high as 7.2%. Well, let’s not wait any longer. 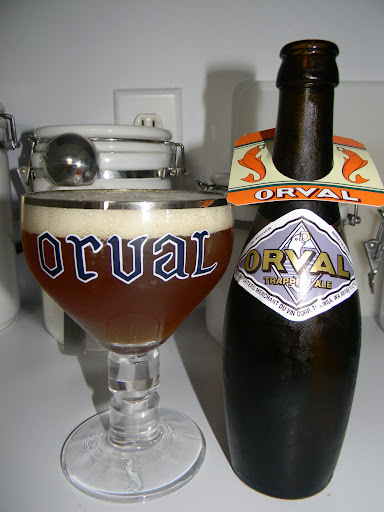 This Orval has an ABV of 6.9% and comes in an 11.2 oz. bottle. The appearance was a burgundy to orange color with a little bit of haze. However, when held to the light I could see a steady stream of bubbles rising from the very center of the chalice. An easy pour produced an unbelievably huge, slightly off white head. It was very, very soapy with enormous bubbles and a very rocky texture (not the most aesthetically pleasing crown in my opinion). Both the retention and lacing were well above average and good. The aroma started with some of that “barnyard funk” combined with a sour smelling lemon sweetness. Other fruits of white grapes and pears contributed more complexity along with subtle, however noticeable, notes of that familiar Belgian yeast and hops. The taste provided a bit more of the “funk” combined with a tart lemon sweetness, which gave the savor a little bit of “bite.” The white grapes were noticed again along with some spiciness that was a mixture of both pepper and cloves. The Belgian yeast was prevalent without ever being overpowering. As the brew warmed all of the flavors started to combine to form one congruent taste. This beer does have one outstanding flavor I must say. The mouthfeel was a solid medium. Very dry, smooth, crisp and snappy with decent carbonation. I was a little surprised that it only left an average amount of flavor behind however. One thing was for sure though… it slid down the throat with great ease. Well, my very first Orval Trappist Ale did not disappoint. It’s not quite the greatest beer that I have ever had, although I can totally see why people think so highly of it. It’s a well made, easily drinkable beer with tons of character. It’s very aromatic (even though that “funk” is not my favorite fragrance) and tastes very, very good. It’s most definitely worth a try if it’s available in your area. What do you guys think of the Orval Trappist Ale? Is it a “world class” beer in your opinion? Please feel free to leave a comment if you would like.